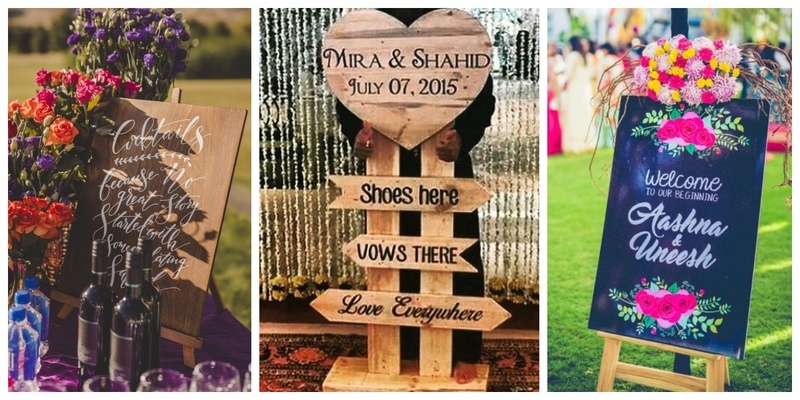 10 ways to include Signages in your Wedding to add that personal touch for your guests! Signages are a super fun way to add a personal touch to your wedding decor. They are cool, they are funky and they are trending big time this wedding season! 1. Signs welcoming the guests in the coolest possible way! This one is my personal favourite! Such a cute and funky way to welcome your wedding guests! The subtle way of welcoming with acrylic art signages! 2. Cute bride and groom signs for the love birds! 4. The aww-gazed signs for their adorable and cute carriers! I have not seen something this adorable in a long time! It definitely made my day! 5. Signages for that kickass cocktail! 6. Lost your way? Funky signages to the rescue! 7. Offbeat to the peak! Here comes the Caricature signages! Ever seen such a cool signage at a wedding? I don’t think so! So which signage are you planning to put up for your wedding?